Vitiligo is a skin condition characterized by loss of pigment and white patches appearing on the skin. Vitiligo most often appears on the hands, feet, face, eyelids, lips, and nostrils. It is often seen in the genital area. It is sometimes mistaken for pityriasis alba, which is a form of eczema. 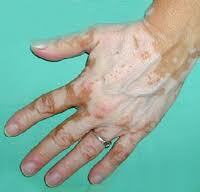 Vitiligo may slowly spread over weeks, months, or years. The cause of vitiligo is unknown but it is felt to be an autoimmune reaction to one’s pigment cells of the skin. It is sometimes associated with other autoimmune conditions such as alopecia areata, thyroid disease, pernicious anemia, and addison’s disease. There are several treatment options for vitiligo including: topical corticosteroids or immunomodulators; UV light therapy; depigmentation therapy; and skin grafts.